A significant majority of Americans believes the country is still not past the housing crisis that began seven years ago, according to a new survey of housing attitudes released today by MacArthur. Americans believe the housing crisis continues, though that view is slowly receding. Three in five Americans (61%) believe we are either “still in the middle” of the housing crisis (41%) or “the worst is yet to come” (20%). While this is an improvement from 2014 (a combined 70%), and 2013 (77%), the persistence of such pessimism seven years after widespread mortgage defaults helped trigger a deep recession is an indicator of ongoing concerns about housing affordability as well as lingering economic trauma. Perceived improvements in the housing situation nationally are not reflected in the public’s personal experiences or what they see happening in their own communities, as housing challenges persist at very high rates. Half of the public (55%) reports having had to make at least one sacrifice or tradeoff in the past three years in order to cover their rent or mortgage. One in five (21%) reports having to get an additional job or work more, 17% stopped saving for retirement, 14% accumulated credit card debt, and 12% cut back on healthy nutritious foods. The segments of the public having to make tradeoffs at the highest rates include renters (73%), racial minorities (68% of Hispanics and 62% of African Americans), Millennials (67%), and city dwellers (64%). Majorities of Americans continue to believe that it is challenging to find affordable rental housing in their own communities (58% in both 2014 and 2015), and housing to purchase (60% in 2015, 59% in 2014), and even more challenging for families at the median income (65%), young adults (80%), or families at the poverty level (89%). Housing is central to the public’s pessimism about the potential for social mobility. The public remains more worried and concerned (60%) than hopeful and confident (32%) about the nation’s future. 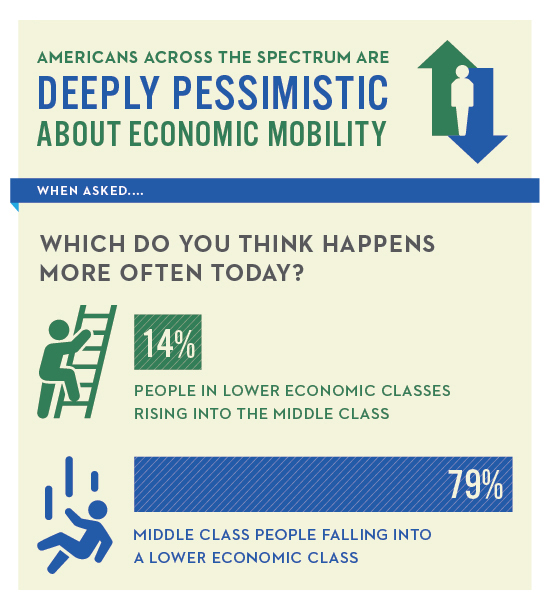 Deep skepticism about the ability of Americans to move up the socio-economic ladder is indicated by four in five (79%) saying it is more likely for “middle-class people (to fall) into a lower economic class” than for “people in lower economic classes (to rise) into the middle class” – a belief that persists across political party, age, and income. The housing crisis saw millions of Americans lose wealth when their homes lost value or were foreclosed. The 76% who believe it is either much more likely (45%) or somewhat more likely (31%) for banks today to foreclose on homeowners than it was a generation ago has only declined slightly since 2013, when 81% believed this. Three in five (62%) now believe it is somewhat (37%) to much less likely (25%) for families today to build equity and wealth through homeownership compared to 20 to 30 years ago. 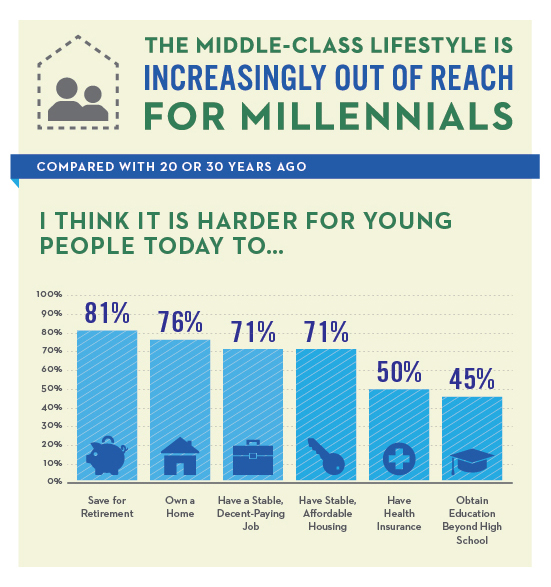 While Millennials are personally hopeful about their future prospects, the overwhelming majority of Americans today think it is harder for young people to achieve a secure middle-class lifestyle than it used to be. Americans as a whole perceive a tough road ahead for Millennials. Three in four (75%) believe achieving a middle-class lifestyle has become harder for young adults, and when it comes to key achievements associated with a middle-class lifestyle, vast majorities believe it will be harder for young people to save for retirement (81%), own a home (76%), secure a stable decent-paying job (71%), or have a stable affordable housing situation (71%) than it was a generation ago. While 88% of Millennials say they are optimistic about their future, including nearly half (48%) that are very optimistic, they expect a more challenging road ahead for their own generation, with significant majorities believing that being able to own a home (77%), save for retirement (76%), have a stable, affordable housing situation (69%), and have a decent-paying job (65%) will be harder for them than it was for previous generations. Still, there is a disconnect between the level of priority housing issues receive from government and the degree of priority the American people would like to see their elected leaders place on housing related policy issues. Half of all adults express the desire for their elected officials in Washington to treat housing affordability as a very (27%) or fairly (22%) high priority. More than half (55%) would like to see their state and local elected leaders treat housing affordability as a very (30%) or fairly (25%) high priority. Yet only 14% believe elected officials in Washington or in their localities treat housing affordability as a high priority. The survey also shows that the public finds several empirically based messages to be very convincing evidence that government should be doing more to provide decent, affordable housing opportunities for families and communities. The pendulum has swung back slightly toward the belief that homeownership is appealing and offers long-term benefits. 56% of adults say that buying a home is an excellent long-term investment compared to 38% who believe that buying a home is no longer an excellent long-term investment and one of the best ways for people to build wealth. This stands in contrast to the initial How Housing Matters survey in 2013 when a majority of the public (57%) said that buying a home was becoming less appealing. The proportion of non-homeowners who aspire to own a home remains constant at roughly seven in 10, with 43% of non-owners saying that homeownership is a fairly to very high priority. Millennials and African Americans prioritize homeownership at even higher rates, with 53% and 46% respectively saying that they place a very or fairly high priority on homeownership. “Most Americans do not believe the housing crisis is over, and this has contributed to the public feeling shaken in its optimism about what the future holds, particularly for younger people. The building blocks of success – having a good job, decent housing, and the ability to save for a secure future – are viewed as harder to achieve than they were a generation ago, and this in turn helps drive pessimism about social mobility. The idea that downward mobility is more likely today than upward mobility turns the American Dream on its head, and is an indicator of how badly confidence has been eroded,” said Geoffrey Garin, President of Hart Research Associates.